Three nights accommodation at Jávri Lodge on an all-inclusive basis, including access to the in-house swimming pool and saunas. Two days driving for one person on a variety of winter tracks (minimum 3.5 hours per day of driving). Two day hosted activity programme for the nondriver, including snowshoeing/skiing, a visit to a reindeer herder, and the chance to receive demo laps in a McLaren 570S on the ice. Visit to Laanilan Kievari for a traditional Finnish gourmet experience. Groups 1, 3 and 5 will have two days driving on the ice with three nights accommodation. Groups 2 and 4 follow a new three day, four night programme, giving you the opportunity to spend an extra day mastering the ice. The McLaren Ice Driving Centre encompasses three lakes and over 100km of almost permanently frozen roads and hillside trails. It is here you will test the limits of both ythe driving and the McLaren 570S. Over two days of driving activity you will rotate through multiple frozen track configurations working with your McLaren Ice Driving Specialist as you master the basics and then advanced driving skills, and ultimately understand how to get the most from the power and agility of your McLaren. Join McLaren for a very special experience 200 miles north of the Arctic Circle. As the temperature plummets in Northern Finland, the landscape crystallises and sets the scene for what will be an unforgettable driving adventure. Within one of Finland’s most expansive winter testing facilities, you will discover the power and agility of the McLaren 570S by pushing your driving skills to the limit with the help of their professional coaches. With its ice tracks specially designed for McLaren, this is the perfect winter wonderland to put the McLaren 570S and your driving, to the ultimate test. 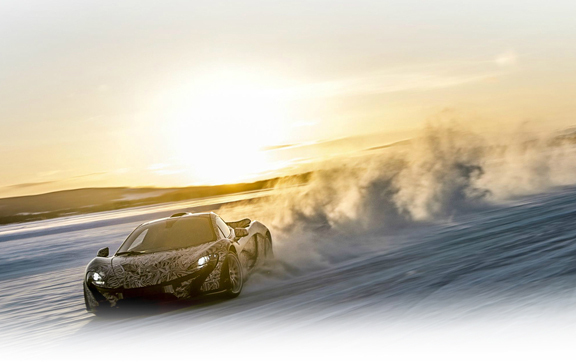 Set within a dedicated winter testing facility in Finland, the McLaren Ice Driving Centre encompasses three lakes and over 100km of almost permanently frozen tracks, making this the most varied ice driving experience in the world. The facility has been expanded for 2018 to offer more track configurations, challenging even those more advanced drivers. When you’re in need of respite from the exhilaration of drifting around the ice and snow, you can relax by the warmth of the roaring fire in the McLaren Kota – a traditional Finnish building. You’ll also want to refuel and the Kota will provide refreshments and catering throughout the day. Lunch is a particular highlight with your delicious Finnish meal being cooked right in front of you over the open fire. Learning to drive on ice is a unique experience, one that will stay with you long after the snow has melted. And of course, being behind the wheel of a McLaren 570S makes it all the more exhilarating. Working with one of their Pure McLaren Driver Coaches you will manoeuvre at your own pace through a variety of track configurations encompassing both ice and snow surfaces. Across two days, there is plenty of time to develop your skills in this one of a kind environment. Your experience will begin when you venture onto the frozen playground that is the McLaren Ice Driving Centre. When on the ice the slightest of steering and throttle adjustments can invoke a drift. Your coach will help you understand how to manipulate the car and use the slide to your advantage. The fast pace does not end on the track. Explore a magical winter landscape of snow-capped forests and frozen lakes with a snowmobile safari and husky sledding experience. The non-driving guests will have the opportunity to further explore the Finnish wilderness with snowshoeing and a visit to the Sami reindeer herders. Here you will learn about the Sami way of life and hand-feed these magnificent creatures. Away from the Arctic cold non-drivers can also indulge in a luxury Finnish spa day with a traditional sauna. Arrival at the Northern Lights Airport in Ivalo and transfer to the exclusive Jávri Lodge. Take on multiple ice and snow configurations from behind the wheel of a McLaren 570S at the McLaren Ice Driving Centre. Their specialist coaches will be there to guide you through every drift and turn. Return to the specialist ice driving facility and progress to more challenging tracks. An additional day on the ice will allow you to build on everything you’ve learned to master advanced driving techniques. The adventure concludes with a journey across the icy landscape led by a team of huskies. Spend time at the husky farm before being transferred, via Jávri, back to Ivalo Airport. *All prices are exclusive of local taxes that may apply. Nestled within the untamed Lappish wilderness is Jávri Lodge, built by Urho Kekkonen, the longest serving President of Finland. He fell in love with the area of Saariselkä and its outstanding beauty, and was inspired to build a place where he could share its charm with those closest to him. 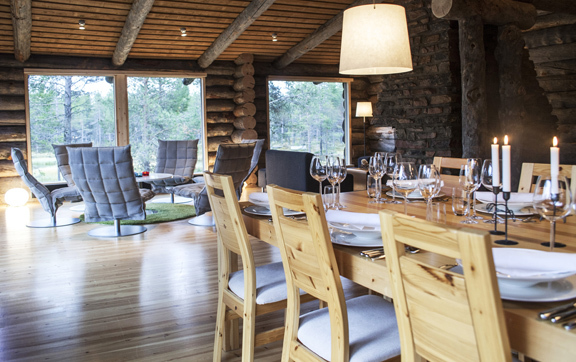 Set amongst vast lakes and forests, and in an ideal position for viewing the glorious Northern Lights, staying at Jávri is an intimate and special experience. Like the countless world leaders who have stayed before, you will find yourself truly relaxed, refreshed and immersed in nature. The service today remains nothing short of presidential with a personalised concierge service, a cuisine that celebrates the best of local ingredients and luxurious accommodation. Every piece of furniture inside has been hand-picked by the owner with the care and attention you would expect from a McLaren Experience. During your Arctic experience, Jávri Lodge will provide the perfect base for relaxation and sharing of stories from the day’s activities. A Christmas like no other awaits you in the heart of Lapland. Take your family away for the magical holiday of a lifetime.